PLUCKY PLANETESIMAL The small, dense remnant of a planet (illustrated) survived the collapse of its sun into a white dwarf, and is now skirting the dead star with a calcium gas stream (yellow) trailing behind it, researchers report. Against all odds, a small planetary body called a planetesimal has survived the infernal death of its sunlike star and now orbits the white dwarf that remains. 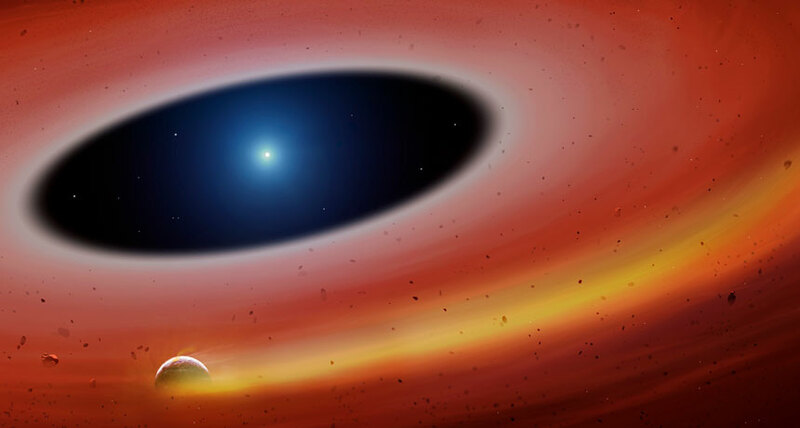 When most planet-hosting stars run out of hydrogen fuel, they blow out their outer shells of gas, obliterating anything within their inner solar systems and leaving behind a dead star called a white dwarf. Planets orbiting farther out can survive this initial cataclysm, but if those planets move in closer, they also get ripped apart (SN Online: 10/21/15) and gobbled up by the dead star’s intense gravity (SN: 9/24/11, p. 10). The rare discovery of the intact planetesimal still orbiting close to the white dwarf SDSS J1228+1040, reported in the April 5 Science, could offer insight into the fate of solar systems like our own and the chemical makeup of planets. Astronomers led by Christopher Manser, at the University of Warwick in England, used the Gran Telescopio Canarias in Spain’s Canary Islands to peer at the debris disk surrounding the white dwarf over two nights in spring 2017 and three nights in spring 2018. The observations of the dead star about 400 light-years away revealed a slight brightening and dimming of certain wavelengths of light in the disk every two hours. That indicated the presence of a cometlike tail of calcium gas trailing a planetesimal as it whips around its star.